PetSafe is owned and operated by Radio Systems, a company that owns many of the world’s finest pet brands. Before they release a new product it undergoes examination by veterinarians, dog trainers and behaviorists, in order to make sure its as safe and as functional as possible. PetSafe has a “Try a lot – keep the good” approach – they constantly develop dozens of new systems but only release the very few they deem to meet their standards. Below is a side by side comparison of the two best PetSafe wireless dog fence systems available on the market as of 2013. Click the “Our Review” link beneath the picture to see our very thorough examination of the product in question. To compare these fences with the top Havahart model, head over to our wireless dog fence reviews page. Collar Neck Size 6" - 23" 6" - 23"
Min. Dog Weight 8 lbs. 5 lbs. 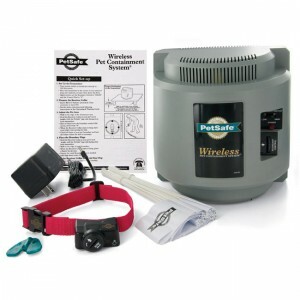 If you browse through our website, you’ll notice we only review wireless dog fences made by PetSafe and Havahart, as we believe them to be the only ones worth your time and money. The two models above (Stay & Play and PIF-300) are PetSafe’s finest systems, which have sold across 6 continents in over 50 countries in just a few years. What Do PetSafe Wireless Dog Fence Systems Have in Common? The two models listed above have a few things in common, and below is a list of those features. Make sure to read the review of each system for a more detailed overview of that particular model’s specifications and strengths. Second only to the Havahart Wireless Fences, PetSafe’s systems provide for an exceptionally stable boundary as far as wireless technology goes. Depending on the model you get, expect a boundary wobble of no more than 1.5 feet, and that’s even with the largest containment area setting. This is almost as good as what wired underground fences deliver. PetSafe’s transmitters can support an unlimited number of dogs. You simply need to purchase additional collars (which cost around $80-$100 a piece) and they will work just fine with just one transmitter. You can therefore easily contain as many dogs as you have. While not the largest in the industry, PetSafe’s wireless fences can cover a maximum circular area of between 1/2 and 3/4 acres (180 to 210 ft. diameter). This should be more than enough for the average house and dog owner, although if you need to create a larger Pet Zone, you may want to go for the Havahart Radial 2, which has a coverage twice as large; though it can only support a maximum of 2 dogs. There is no commonality here. The PetSafe PIF-300 for example comes with a replaceable 6 volt battery that can last for up to 3 months and costs a few bucks, while the Stay & Play system has a rechargeable battery. Simply check our comparison charts to quickly determine the type of battery that comes with a specific system. All of PetSafe’s wireless dog fences come with a collar that will fit any dog with a neck size of between 6 and 23 inches, making it possible to contain dogs of all shapes and sizes. If you want to mount the transmitter to the wall, you will need to use screws – there are no adhesive strips provided, which mostly has to do with the relatively large size of the transmitter (the larger it is, the more difficult it is to hold with adhesive due to the extra weight). Keep in mind you can always just place the transmitter on a table without mounting it, as long as you don’t cover any of the ventilation holes and stick to the tips provided in our signal interference reduction guide. All of PetSafe’s systems are designed for dogs that are 6 months or older. In fact, this holds true for pretty much all wireless fences on the market; a younger dog can’t be trained properly and the static correction may be too much for it. You’ll be receiving 50 boundary training flags with your package, regardless of whether you go for the PIF-300 or the Stay & Play. This should be just about enough for a containment area with a radius of around 70 yards, however if you plan to go beyond that then we recommend buying an extra set of 50 flags for a few dollars. Make sure to read our Wireless Fence Installation Guide for more information. Both of the above mentioned PetSafe fences come with relatively small receivers, making them comfortable to put on and surely comfortable to wear as well. The antenna is contained within the receiver and does not pass through the collar itself, making easy to remove the receiver and attach it to a different collar should you want to do so. In case you did not know, contact probes are those two pins protruding from the receiver and which deliver the static correction. The long pair should be used for dogs with longer / thicker hair, while the short ones are for dogs with less and finer hair. PetSafe’s wireless fences for dogs come with a collar that is rated as water-proof; this means they can withstand rain, snow, and even a short submersion in water. Water-proof does NOT, however, mean that your dog can go swimming with his collar on – after prolonged submersion in water, the collar will malfunction. If your dog loves playing in water, you need a water-resistant collar, such as the one that comes with the Havahart Radial 2 fence. Changing the correction level is done directly from the collar itself. If you don’t know what setting to choose for your dog, please see our wireless fence dog training guide for details. After the first year, you will need to pay for any repairs made, however you’ll be entitled to a significantly discounted repair and labor price. If you need to contain a somewhat unusually-shaped area (other than a circle), or if you simply need to increase the coverage of your wireless fence, you can buy additional transmitters and they will work in conjunction; each unit can have different settings and they will still contain your dog to the designated zone. PetSafe’s wireless fences for dogs include a tester light which can be used to test whether the collar is working properly. PetSafe delivers nothing but quality. If a wireless dog fence is what you are after, make sure to check out our reviews, and especially that of the PIF-300 system, which is the finest system available for dog owners on a budget.